Country Floors, a premier luxury tiling and flooring company announces their new fall tile collection, Baba Chic and Mod Glam. Baba Chic and Mod Glam is the latest decorative tile collections offered from the ever-growing tile and flooring industry leader. The new collection is inspired by historic Tunisian artisans and the mid 20th Century. The ‘Baba Chic’ mosaic tile collection illuminates the cultural heritage and craftsmanship of Tunisian artisans and brings it to the world of modern design. 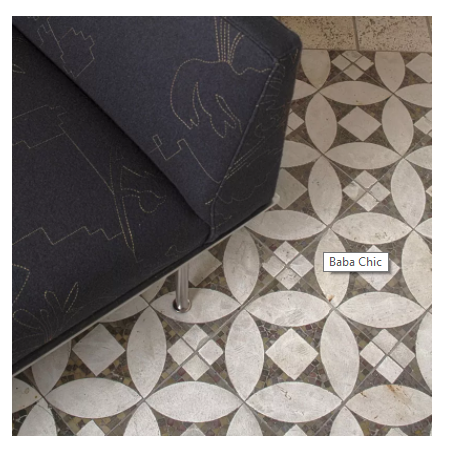 Innovative as it is artistically beautiful, Baba Chic creates a bold statement for any wall or floor application. This exclusive collection of 18 historically inspired patterns known for their intricate beauty in geometric and floral designs, use a combination of marble and limestone. Baba Chic is available in a number of color combinations, shapes, and sizes. The collection compliments usage in any kitchen backsplash, study or wine room, powder room floor, or entry foyer. The ‘Mod Glam’ tile collection was inspired by the ravishing mid 20th Century, which was recognized in the United States as one of most influentially design windows of our time. Country Floor’s ‘Mod Glam’ collection is diverse with design options and elements that range from interiors to architectural developments. The Mod Glam tile collection can be found in six unique water jet patterns, Parker, Emerson, Bertola, Blocks, Eames and Panton. Each named after the master influencers of this design period. For additional information regarding COUNTRY FLOORS products or showrooms, email justine(at)marblesystems(dot)com or visit COUNTRY FLOORS website at http://www.countryfloors.com for specific showroom locations and phone numbers. Founded in 1964 COUNTRY FLOORS has long occupied the fashion high ground in the ceramic tile and stone industry in the United States. Famous for vast collection of the finest designers from the 17th, 18th and 19th centuries, COUNTRY FLOORS also offers a large selection of handcrafted glazed ceramics, contemporary glass tile, a wide variety of mosaics, high- style natural stone and handmade terracotta. Many of COUNTRY FLOORS tile and natural stone meet the requirements of hospitality and commercial designers while also servicing the homeowner that desires a unique tile design. COUNTRY FLOORS is a MARBLE SYSTEMS company, famous for its natural stone collections using the latest manufacturing technologies. With three distribution and design centers in greater Washington, D.C. area, New York, Florida, Puerto Rico and Los Angeles, COUNTRY FLOORS is uniquely positioned to provide a virtually unlimited supply of the industry¹s highest quality.